The regular story will be back next week. Bidi just wanted to share some of her art. Welcome back, hope you had a good and healthy holiday. Always a pleasure to see Bidi in a non-explosive moment. YIPE! even BIDI is into Pokemon! They don't have smart phones or computers in the apocalypse but they still have imagination. I actually haven't played Pokemon since my son was about 12 years old. He's 30 now, so it's been awhile. Daaaaaw isn't that lion just the very cutest.. wait.. "dangerous"
Yes, it looks very dangerous! Don't do that Bidi. You're making yourself cross eyed. Is that a nod to Apocalypse Now on her helmet? Not directly. 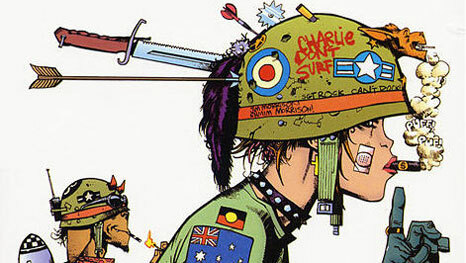 It's a nod to Tank Girl comics, but I'm sure Jamie Hewlett meant it as a nod to Apocalypse Now. Sounds about right, Tank Girl comics always had a billion pop-culture references in it. I suspect Bidi is a fan. She's a huge Tank Girl fan. She has such a wonderful imagination. Little known fact: The Porcu-lions roar sounds like "Porc-you! Porc-you!" nice, and welcome back Dizz but if I may ask something non comic related are you still planing on doing your mod for fallout 4? I loved it in New Vegas and am really looking forward to seeing how it sets up in 4, if you're still planning to do it that is. I'm about halfway done with it now. Here's some in-game shots.